Set in Stalin’s Russia, The Betrayal is a sweeping drama that centers around the tragic illness of child who loses his leg due to cancer. Despite the doctor’s best efforts, the child succumbs to the illness and dies. The saga addresses universal themes of parental responsibility, the corruption that comes with power, and medical ethics while providing interesting historical commentary on the Soviet regime that was respected and feared. Helen Dunmore’s prose is exquisite, transporting the reader from the regal dance halls of Leningrad to the hellish nightmare of Moscow’s interrogation rooms and infamous prison cells. Dunmore is certainly a gifted writer who I look forward to visiting again in the near future. WHAT AN AMAZING READ! SO GLAD I DISCOVERED THIS AUTHOR ON THE BOOKSTORE SHELF!!!!! Now that THAT is out of the way, let me explain why I adored this book. Set in the canyons and hills of Woodland Hills, California, the novel takes a fresh look at the pursuit of the American dream. Through the lives of two couples — a wealthy American couple and a homeless pair of illegal immigrants struggling to make their way in a foreign society — Boyle beautifully explores the similarities despite their individual struggles. Reminiscent of Steinbeck’s Of Mice and Men, I would recommend that teachers and book lovers of all types take the time to read The Tortilla Curtain in order to be challenged and inspired. School is out for summer, so that means I actually had time to read an actual book! Jesus Boy told the story of the members of The Church of Our Blessed Redeemer Who Walked Upon the Waters church located in central Florida. This congregation is filled with talented members who all struggle with their own frailty, immorality, and sinfulness. 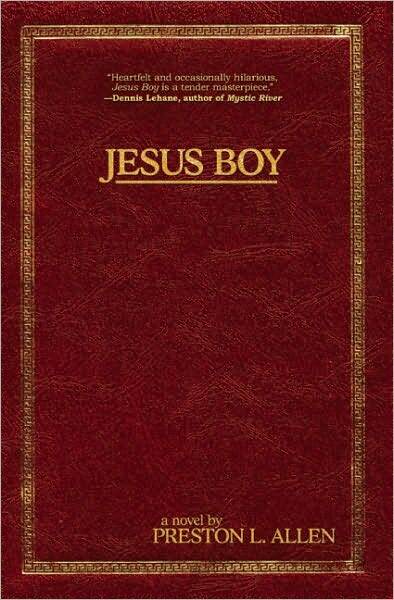 Despite its title, the novel is NOT intended for a Christian audience. Filled with humor and stereotype, Allen’s novel explores the charismatic church movement of the African-American community with a sharp — and often irreverent — tongue. I’m glad I read the book, but don’t offer it as a recommendation for others. 2 out of 5 stars. The latest installment in my audio book adventure was Body of Lies. The best thing I can say about this book: it passed the time while I was driving. The plot was trite and felt as though I have read it in a million other works. Admittedly, I am not terribly upset since this is the first unsatisfying audio book of the year. With a week of travel ahead of me, I’ll pick up a couple of books for the road and move right ahead. Once again, Jodi Picoult comes through with another amazing read! Lone Wolf is the story of a family facing a difficult decision after a car accident leaves the father in a coma. The daughter holds out hope for a full recovery; the estranged son returns from Thailand after a six year absence and fights for the right to terminate life support. Through all the twists and turns, these siblings ultimately discover that they have a lot in common with the wolf packs that their father spent his life researching — most notably that nothing is more important than family. My only regret after finishing this novel is that I have to wait another year to read Picoult’s next finely crafted novel. While the anticipation is killing me, I look forward to it, knowing that it will be another piece to add to my “must read” list. One Summer started out as a book that grabbed my attention and wouldn’t let go. The novel tells the story of a young couple with three children facing a harsh reality. The father, a veteran, has a terminal disease and is expecting to die at any moment. In a cruel turn of events, his wife is in a tragic car accident, leaving her husband and children behind. Baldacci’s writing in the first half of the novel is splendid. The father’s struggle to accept his own approaching death, feelings of helplessness as his children are relocated with family around the country, and his triumphant return to health are powerfully crafted. Once the family is reunited and settle for the summer in South Carolina, the novel seemed to lose some of its forward momentum and drive. What I had hoped would be an inviting, heart-felt novel turned out to be a lazy beach read. I’m no worse for the wear, but my life is no better for reading it either. My rating: 2.5 out of 5. The bar for quality reading this year has been set very high! Tom Franklin’s novel tells the story of two men, Larry and Silas, who grew up together in southeastern Mississippi. Silas is a black boy; Larry is white. As they grow, their lives take different paths. Years ago, a young girl suddenly disappeared after going on a date with Larry. Everyone assumes that Larry was responsible for her disappearance and death, but he was never tried due to a lack of evidence. Now another girl has gone missing and Larry is the prime suspect. Silas has returned to the deep South as a police officer in the small town, investigating the kidnapping. Is Larry a monster or a misunderstood introvert? Does Silas know more about the situation than he is telling? My review: 4 1/2 out of 5……incredible story, wonderful writing and engrossing.